Many of us feel overwhelmed with all the things we want to do. But we mustn’t allow ourselves to feel like we have to accomplish every thing all at once. Just pick one thing to do today. Or just one thing to focus on. It’ll take away the overwhelming feeling if you just concentrate on one thing. Do you want to save money? Then pick one way you can cut back on spending and put that amount away. Can you handle just having 2 cups of Starbuck’s coffee instead of 3? Do you want to lose weight? Then pick one thing to create a new habit. Drink water with meals instead of that soda. Add an extra serving of vegetables at dinner instead of reaching for that extra roll. I recently started drinking green smoothies and without even trying, I’ve lost 2 lbs and some inches. I also decided to save some money by doing the 52 Week Money Challenge. It starts off small, so you can get used to saving without feeling overwhelmed. The point is, everything you want to accomplish can be accomplished by simply choosing one thing to focus on today. 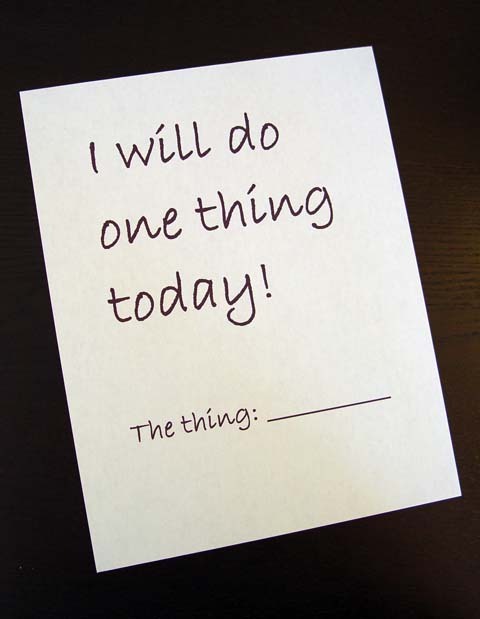 What is that one thing that you can do today that will put you one step closer to your goal?